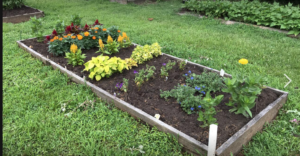 June in SE Virginia is a great time to plant lots of garden vegetables! If you have less space, it’s also a good time to plant all kinds of beans – green and wax beans, crowder or field peas (including black-eyed peas), butterbeans, edamame, and more. If you are square-foot gardening, you should plant 9 bean seeds on a grid in each 1 foot square. It’s also a good time for a second planting of summer squash and cucumbers now. These and all of the above crops can be directly seeded into your garden spot. It’s also not too late to set out tomato, eggplant and pepper plants for an extended harvest of these crops. Plants (if you can find them) will be marked down at garden centers and should flourish once they get their roots in the ground. With the summer heat, it’s important that you don’t forget to water, especially in containers and raised beds. Small containers dry out quickly and will likely need water every day. Keep weeds under control and watch plants for insect pests. And don’t forget to harvest often – most of our vegetable crops respond to harvesting with producing even more! If you’re getting your produce from local farm stands and markets, find out what’s in season at Virginia Grown.